We call Bottle gourd as ‘Gardudde‘ in Konkani (there are other names also). ‘Dudde‘ is pumpkin, I wonder if it is related to pumpkin in someway?? I loved these burfis from my childhood. I would go on eating a half-dozen of them at a time. I think the color of these largely depend on the sugar.Â Though there are many bottle gourd dishes in Konkani cuisine, my personal favorite is always this burfi. Try it yourself to understand how good it is. 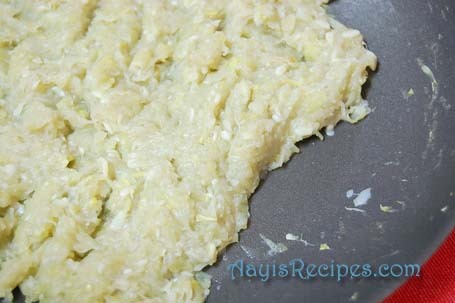 In a thick bottomed pan, cook grated bottle gourd (do not add water, when it starts cooking, bottle gourd leaves water). In the traditional method, the pan is covered with a plate and water is added on the plate. This allows to cook faster. When almost all the water is gone and bottle gourd is reduced in volume, add the sugar (same quantity as the cooked bottle gourd). Keep mixing to avoid sticking to the bottom. Cook till the mixture becomes dry and the ends get white color(if the mixture does not gets dry, add more of sugar and keep mixing). Take out from the heat. Add cardamom powder. Grease a plate with ghee and spread the mixture with the help of a rolling pin(apply ghee to rolling pin to avoid sticking). Allow the mixture to cool and cut into desired shape. this looks like a good recipe shilpa- i will try this. yes, bottle-gourds and pumpkins(also bitter melons, squashes, marrow/zucchini, cucumbers/gherkins, water-melons, winter-melons,etc) are all in the gourd family…”cucurbitacae”. Hi Shilpa….You can prepare this out of butternut squash/pumpkin too (as it is Haloween time here). My mom makes the best of carrot barfis. This one i havent tasted made by her, although recipe looks same. Thanks for sharing. Everytime I come back after a blogging break, I have a lot of catching up to do especially in your site. 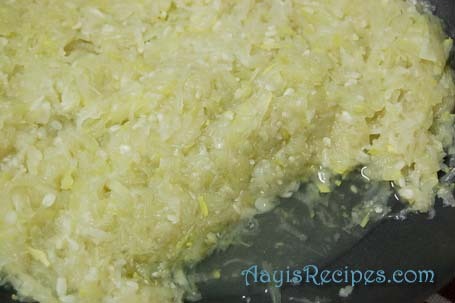 Bottle gourd burfi looks good, I only ate halwa made with this veggie so far..
You have loads of paitence cooking these sweets….a big pat on the back from moi! these sweets are absolutely local and can be found only in 2 places- one ofcourse is the place of origin and the other is ur website!..coming on this site is like walking down memory lane, for me! My summer vacations in my childhood were spent in Honnavar, which is close to Kumta and I do remember these sweets at the local mithai shop and the fair (‘ter’). The burfi looks amazing Shilpa. Also, your ganti reminds me of that way I make shaarpare except the shape. Thanks for sharing. Delightful sweet. My mom makes Dhudhi halva. Burfi is new to me. Thanks for the recipe. Thanks to you all for the lovely comments. Supriya, I feel on top of the world after reading your comment :D.
Shilpa …I agree with Supriya….Your site smells of the earthyness and the goodness thru your recipes. BTW…the Badampak also looks like this. Its amazing that the number of recipes, their names in different languages you always try to mention. My childhood memories of Karwar -North Karnataka, Bangalore all seem to come in front of me when I browse through your website….especially my motherâ€™s javna (oota, khana, swaipaâ€¦) tasteâ€¦really appreciate your effort & keep it up! well well the earth is round, the same recipe is known to the north indians as lauki ki log(lodge). 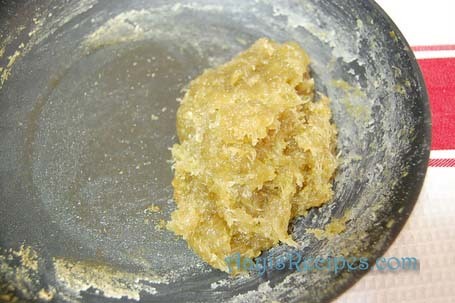 a popular varient using khoya (prepared by simmering milk on low heat, in a thick bottmed pan till it thickens and then becomes a crumbly solid) is also prepared which is a richer and heavier version of the same sweet. both recipes though similar have their unique tastes and beleive me both taste as heavenly. Gardudde is lauki in hindi and Dudde is kaddu both of them belong to the same family i.e., cucurbitaceae. other members include cucumber, milk gourd, melon ,watermelon, bitter gourd i.e., almost all the gourds and squashes. but now i must go and cook the lodge you have tempted my taste buds as you always do. I was looking a recipe for bottlegourd burfi.As i visited ur site I was so glad to see the recipe & that too with a demostration. 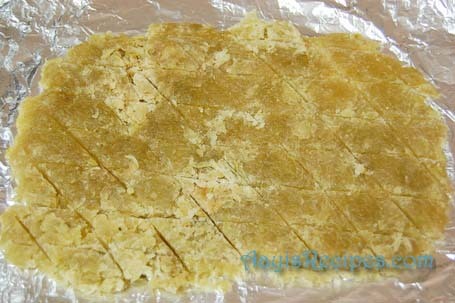 Hi Shilpa,this burfi luks gr8 n sounds traditional. :-)I havnt seen bottleguard here..(tryng to search one desperately aftr reading ths simple recipie)…. Betwn,just a thought n nid ur feedback pls…. iv got Acorn Squash…. wh is orange in color, not sweet in taste..,n is v.similar to pumpkin…Its smaller in size ompared to pumpkin..
Can i try ths burfi with the acorn squash..?? Also, pls lemme kno wat else can be made frm acorn squash, apart frm putting it in bhaji(vegetable) n curry..
Shilpa: Sorry Meenal, no idea. Never tried Acorn squash. Hi Shilpa,i got Bottleguard to make ths quick burfi 🙂 Jst a query,can i add some dry fruits like cashews n pistachios to make ths burfi more rich..?? …. i hope this wont disturb/hamper d original taste of d taste..! !..pls lemme kno ur opinion..
Shilpa: Meenal, haven’t tried dry fruits in this. May be you can add it to a small portion. Hey Shilpa,m done with d barfi n its turned amazing..N ofcourse v.tasty.. :-)I added Finely chopped cashews to it..Also color of my burfi has turned out dark green n nt yellowish..as ur pictures show..! (might b coz i dint peel d bottleguard skin n it was v.fresh n green i think)But d barfi luks really rich with leaf green background d cashew pieces embedded in it..!Nw, M lil worried..coz it`l gt finished soon ;-)Niways, thnks again for such lovely recipies..
Betwn,i think we can make similar barfis using d pumpkin n butternut squash n even carrot..let me kno if uv tried with any of these….n update the same in ur blog. Shilpa: Meenal, I haven’t made the burfis with pumpkin or carrot. But have heard about the carrot burfis before. If I try them, I will surely post them here. Is this same as dumroot?? Shilpa: I haven’t heard od dumroot before. But when I searched in google, I found both are same. Do I have to peel the gardude before I grate it? Shilpa: You can use skin also. But for best results, remove skin. Can i add powdered sugar. 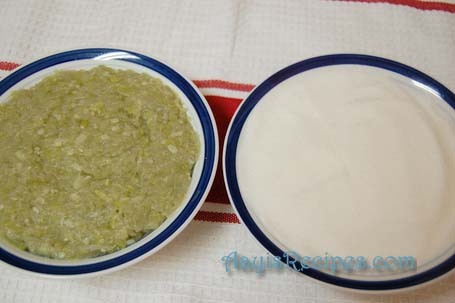 I am desperate to prepare this as my DH loves bottle gourd, will let you know the results. Thanks. i m very glad to see this recipe on ur site thanks for sharing it. i have eaten this burfie in my childhood when my mother usually prepared it for me .this is my favourite desert . now my mother is not more and when my father asked me to make this burfie .i was a little afraid because i forgot the recipie.and now when i came to ur site i m happy to see this here. thanks a lot .you made me to remember my mother’s cooking . Hi Shilpa 2day i am trying this recipe let’s see how it turns out. I am a regular visitor of your site and try many different authentic konkani dishes . They come out very nice. 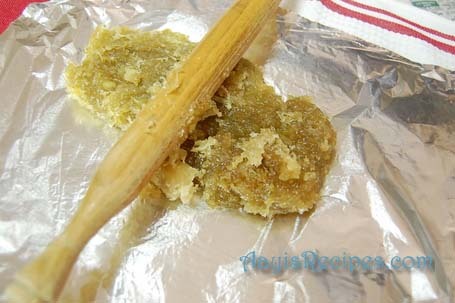 I tried this bottle gourd barfi recipe today . As the barfi was not getting dry i kept on adding sugar. 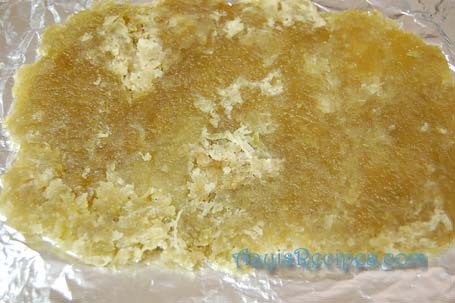 It became dry but looks like the amount of sugar became more the barfi has become kind of caramelised. Gardudde che taste kalna bari sakkar khelle mhanke jatta 🙁 give me some tip on if I can neutralise the sugar and get the normal taste of barfi.